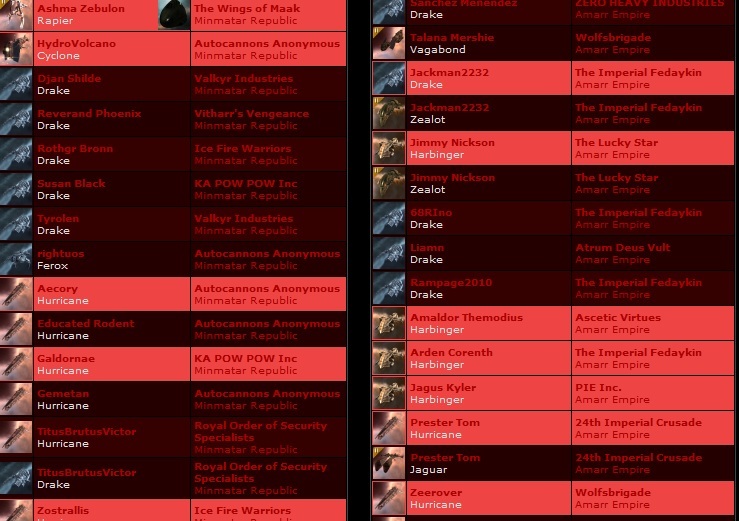 Monday night was another fun night of pew on the Amarr/Minmatar front. Instead of ninjaing around, the Minmatar actually got together and created a unified fleet, with many Minmatar corporations represented—and many people outside of LateNight. It’s probably the first time in weeks I’ve seen a major, mixed fleet midweek in the US time zone. I have to admit it was kind of fun. We even had a couple people I’d never met before, including one very new Eve player. He died pretty quick but was a good sport, and his fit didn’t look too bad, even if it was partially tech 1. I laughed when he asked how on earth to ‘post a killmail.’ It’s been so many years since I started playing I forgot how overwhelming all the parts and pieces of Eve can be when you’re first starting out. Coms, killboards, warping, primarying targets, aligning, and so on and so forth. Gald kindly stepped up and gave him some help. Hopefully the guy had some fun and will stick around. We’re a pretty hard bunch to get to know sometimes in the Minmatar militia. Anyway, we mainly formed because there was a big Amarr bc fleet roaming around, and instead of ninjaing around to kill stragglers and left-behinders, we were in the mood to face them head on. Unfortunately, even with a combined fleet, they still outnumbered us at the onset, so we started adjusting our fleet a little to incorporate some heavy ecm to help out. We were a little slow in forming, but eventually had a decent little gang of nano drakes, shield canes, and scorpions, plus some smaller stuff such as a dramiel and a rifter. We had every intention of leroying in, and hoped that our scorpions would do their magic before we died in a fire. They had a lot of stuff roaming around including 5-6 drakes and 6-7 hurricanes, that we saw. The thing with the Amarr is that the fleet you see is usually not their entire fleet. They tend to come out of the woodwork after the first shot is fired, so we knew it would probably be a close one and might not end in our favor. Unfortunately, they ran from us. We tried warping to their location, and following them around a little, but they refused to engage. Apparently, they didn’t have the normal 5-1 odds in their favor so they were suddenly not interested in playing. A scout reported them as aligning to our gate from another gate in system, and Djan, our fc, smartly had us warp to their gate at 30k to see if we’d land on anyone aligned. As soon as we landed they skittered away, but one of the guys caught a bc trying to get out and we made short work of him. By that time the Amarr gang was looking a bit smaller than before, so we decided to ship down to smaller stuff and get rid of the scorpions. Even then, we couldn’t find much that would engage. Later into the evening Predator Elite logged on, spoiling for a fight, which we decided to give him. Some of us had gone somewhat afk so it took a while to pull everyone together again, as well as get some people who had just logged on up to speed on what was going on. Pred grew a bit impatient and went roaming out 6+ jumps. We didn’t follow, and he eventually came back with his fleet—a macherial, vindicator, a bunch of bcs, and several random other ships. It was kind of a strange fleet and we weren’t sure what to expect from them. A large friendly rifter gang floating around unfortunately made our numbers look a little beefier then they were, but eventually Pred came back to kourm and an all out battle ensued, as we warped on top of them after they jumped through a gate. Thankfully, they didn’t run away. We ended up holding the field, and only marginally winning the fight. We got more kills, but the ships they killed of ours were worth more, so the ISK efficiency was pretty 50/50. If they had kept their shinys at home and brought useful stuff they weren’t afraid of losing (the mach and the vindicator kept warping away if they were engaged, or jumping back through the gate) they probably would have done a lot more damage. Also, we were in rangy stuff (which is unusual for us I might add) so we weren’t always able to hold points on things, as most stuff could burn away and warp out. Perhaps if we were all in in-your-face ships, we may have been able to hold points better and do more damage on our end. Time will only tell what the rest of the week will look like, and whether this streak of the Minmatar being somewhat more active then usual will last.